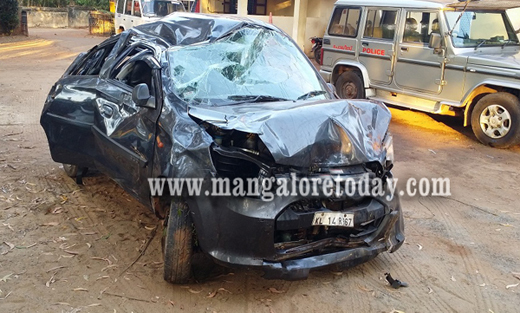 Kasargod, Jan 23, 2017: One person was killed and two others were critically injured when the Maruti Alto car in which they were travelling went out of control of the driver and fell into a gorge near the Vamanjoor check-post at Manjeshwar on January 22, Sunday. The deceased is Samshuddin (28). The injured Mohammad Amir (30) and Abdul Latif (29) have been admitted to hospital. The car was badly mangled in the mishap which occurred close by the Uppala bridge. Meanwhile, interestingly a gun was found inside the car. Cops are now investigating as to who was the owner of this gun.